Water Vapour imagery showing the location of TC Winston at 10am Sunday 21th February 2016. This image is from the JMA, with MetService colour enhancements. TC Winston was located near 17.4S 175.3E about 175km west of Viwa or about 230km west of Nadi at 10am today (Sunday 20th February). The central pressure of the cyclone was estimated to be 930hPa, making it a Category 5 cyclone, and it is continuing to move westwards at 24km/h. Winds close to the centre of the cyclone were estimated to be around 205km/h and with momentary wind gusts to 285km/h. Fiji Meteorological Service warns of periods of heavy rain and squally thunderstorms, damaging heavy swells and flooding, including sea flooding of low lying areas. A GALE WARNING REMAINS IN FORCE FOR VIWA ISLAND. 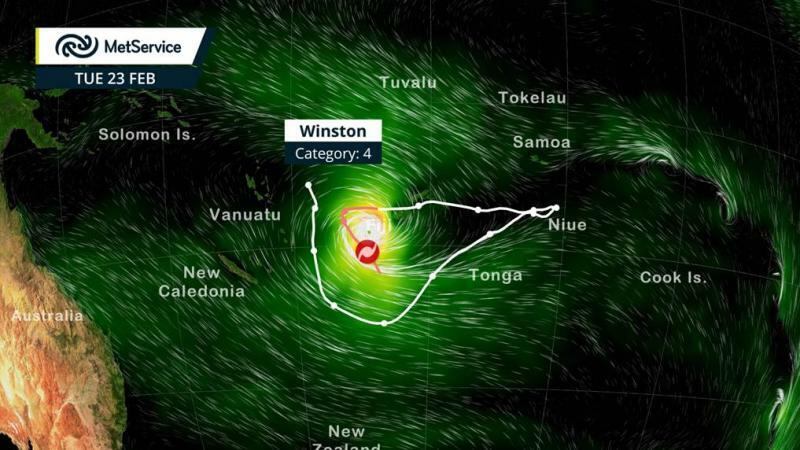 SEVERE TROPICAL CYCLONE WINSTON CENTRE [930HPA] CATEGORY 5 WAS LOCATED NEAR 17.4 SOUTH 175.3 EAST OR ABOUT 175KM WEST OF VIWA OR ABOUT 230KM WEST NADI AT 9AM TODAY. THE CYCLONE IS MOVING WEST AT ABOUT 22KM/HR. CLOSE TO ITS CENTRE, THE CYCLONE IS ESTIMATED TO HAVE AVERAGE WINDS OF 205KM/HR AND MOMENTARY GUSTS TO 285KM/HR. ON THIS TRACK, THE CYCLONE IS EXPECTED TO BE LOCATED ABOUT 315KM WEST OF VIWA OR ABOUT 370KM WEST OF NADI 9PM TODAY AND ABOUT 365KM WEST OF VIWA OR ABOUT 415KM WEST OF NADI AT 9AM TOMORROW. EXPECT DAMAGING GALE FORCE WINDS WITH AVERAGE SPEED OF 65KM/HR AND MOMENTARY GUST TO 90KM/HR.WINDS EASING TO STRONG WINDS WITH AVERAGE SPEED OF 55KM/HR AND MOMENTARY GUST TO 80 KM/HR IN THE NEXT 6 HOURS. PERIODS OF RAIN, HEAVY AT TIMES AND SQUALLY THUNDERSTORMS. RAIN EASING LATER TODAY. DAMAGING HEAVY SWELLS. SEA FLOODING OF LOW LYING AREAS. STRONG WINDS WITH AVERAGE SPEED OF 50KM/HR AND MOMENTARY GUST TO 75KM/HR. WINDS EASING AND BECOMING MODERATE TO FRESH FROM AFTERNOON. OCCASIONAL RAIN, HEAVY AT TIMES AND SQUALLY THUNDERSTORMS. DAMAGING HEAVY SWELLS. FLOODING INCLUDING SEA FLOODING OF LOW LYING AREAS. Satellite image from NOAA from this morning February 20th 2016. Image created by MetService using WeatherScape. White line is the track Tropical Cyclone Winston has already taken. The pink line is the forecast track out till Tuesday the 23rd of February. On this track, the cyclone is expected to be located about 280km west of Viwa or about 340km west of Nadi at 7pm today and about 340km west of Viwa or about 395km west of Nadi at 7am tomorrow (Monday 22st February). The tropical cyclone is expected to weaken to a category 4 cyclone and is expected to continue to move in a southeast direction before heading westward again. Over the next few days TC Winston is expected to take a more southeasterly track, which means there is a low chance that it could impact New Zealand towards the end of next week. A number of global weather models expect the future track to loop southwest and then northwest before weakening near the Coral Sea, but there are also some models which have the track moving further south (see one of these models below), although it is too early to give an accurate forecast of the exact impacts to New Zealand. MetService meteorologists are monitoring this tropical cyclone and working closely with Fiji Meteorological Service as TC Winston is currently above a latititude of 25S (MetService take over responsibility for offical advisories and bulletins when the TC moves south of this). Range of possible future tracks for Severe TC Winston based on GEFS data. (Please use this image responsiblily, explaining the uncertainly of the TC track.) Image from NOAA Earth System Research Laboratory. With tropical cyclones there is always some uncertainly associated with the tracks they will take, and the gobal weather models can change considerably from day to day until the track becomes stable (where the models are in more agreement). If this Low does affect the North Island of New Zealand, it will have evoled into a mid-latitude cyclone (no longer a tropical cyclone), and it's effects could include increased sea swell, rain and wind. Any severe weather effects for New Zealand caused by tropical cyclones will be included in Severe Weather Warnings, Watches and Outlooks, as well as marine warnings and forecasts. http://metservice.com/warnings/severe-weather-warnings. MetService advise people in New Zealand and planning travel to the Pacific to keep up to date with the latest forecasts at www.MetService.com. You can find a recorded video clip with information and commentry on Tropical Cyclone Winston at http://www.metservice.com/tv/.